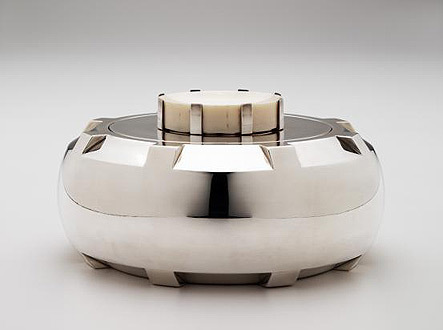 One of my favorite decorative arts designers of the past is Puiforcat, makers of exquisite silver. The firm was originally founded in 1820 to serve the French court, and for the next 100 years they did a brisk trade largely making reproductions of 18th century silver. The quality is superb and silver hallmarked Puiforcat is very, very desirable. For me though, I look to the pieces of Jean Puiforcat (1897-1945) who brought the luxury house into the 20th Century. 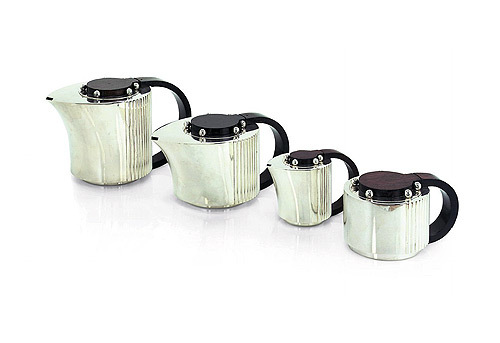 A master craftsman from Paris, his work takes the elegant, stream-lined forms of the Art Deco period and combined them with luxurious woods and finishes; silver tureens with ebony or ivory handles; boxes with lapis lazuli and shagreen inlay. And some of his greatest creations are in flatware – pieces you can use and appreciate everyday! 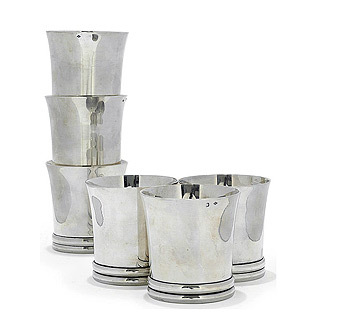 These silver tumblers are so elegant – use them as intended or fill them with flowers at each place setting at a dinner. Their sleek forms with geometric bands at the base scream 1930s sophistication. I know not everyone appreciates a silver tea service, but how stylish is this!?! The contrast of the wood with the silver and the detailing of the vertical band is marvelous. Imagine the luxe in using something like this for after dinner coffee, or even just flaunting at home on a sideboard. 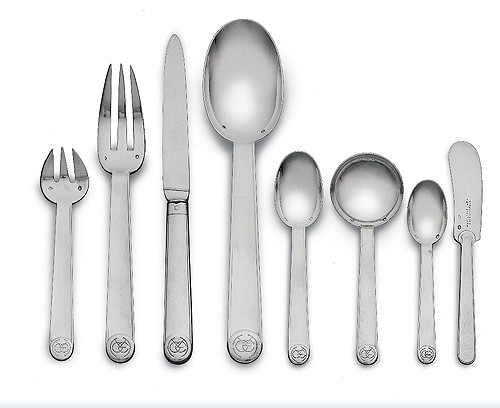 Puiforcat’s Normandie pattern flatware was designed for the great ocean liner of the same name. At the height of the Great Depression, the French government organized the top design firms of France to furnish the liner as a triumph of French style and taste. Companies like Ruhlmann, Christofle and Puiforcat created pieces for the ship that were copied for the homes of wealthy patrons. The clean silhouette of these pieces, coupled with that great deco monogram may be slightly chunky for some, but it’s still stellar Deco design. In 1941 with German soldiers in Paris, Jean Puiforcat moved lock, stock and barrel to Mexico where he continued to produce beautiful things often inspired by Mayan art and motifs. Be careful though, even though they retain the “look” of his French pieces, they are unfortunately not as collectible and you would be better to invest in the earlier French made pieces!! Not one to rest on their laurels, kudos to Puiforcat for turning out new and interesting objects today. For instance, the Spanish Garrido siblings are designing pieces for them. They are also producing items not made in sterling silver. Recent additions to their line include a sterling silver champagne taster, a set of professional chef’s knives, and flatware in stainless steel. It must be difficult for such a storied house to look forward, and yet it’s so important that they do just that to build on their client base and to inspire new generations of buyers.